The Unstoppable Wasp #1-8 Jeremy Whitley (Writer), Elsa Charretier (Artist), Megan Wilson (Colorist) Marvel Comics January - August, 2017 The Unstoppable Wasp was released in January 2017 as part of the Marvel NOW! initiative. The series focuses on Nadia Pym (later Nadia Van Dyne), the super-scientist daughter of Henry Pym and his first wife Maria Trovaya. 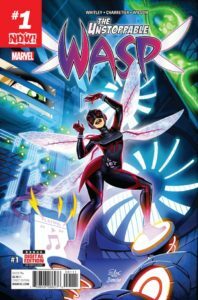 The Unstoppable Wasp was released in January 2017 as part of the Marvel NOW! initiative. The series focuses on Nadia Pym (later Nadia Van Dyne), the super-scientist daughter of Henry Pym and his first wife Maria Trovaya. Nadia was raised in the Red Room, a secret Russian facility for training young girls to be assassins. She escaped and fled to New York City, hoping to meet her father, but ended up taking the role of the superhero the Wasp. Throughout the series, Nadia learns to balance science and superheroics as she confronts her past and helps push her way to a brighter future. 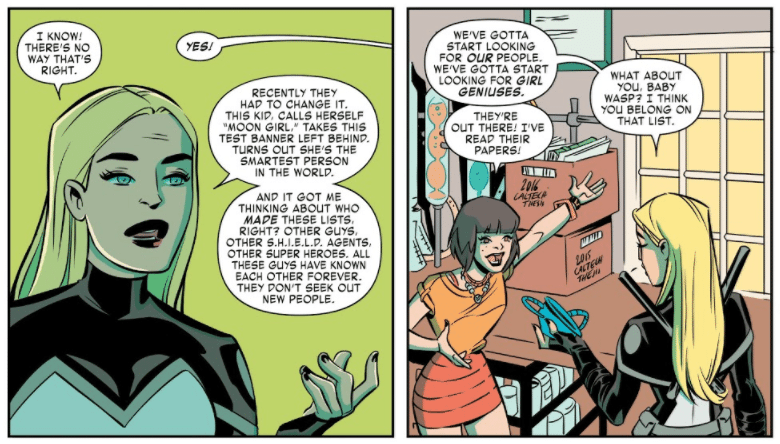 Obviously, comics are for everybody, but The Unstoppable Wasp reads as a love letter to girls in STEM (science, technology, engineering, and mathematics) fields. One of the main threads of the series is G.I.R.L. (Genius In Action Research Lab), Nadia’s team of herself and her teenage female friends. Each member of G.I.R.L. has a different focus: Shay the physicist, Priya the biologist, Taina the robotic engineer, Ying the chemist, and Alexis who’s not really interested in science but came along with her sister. Nadia has more of a generic “comic book science” discipline, but since she has the most “comic book” backstory, that’s a bit to be expected. The team itself is also a reflection of the modern, diverse New York City that it’s set in. Shay is African-American and is implied to be queer, Priya is a first generation Indian immigrant, Alexis and Taina are Puerto Rican, Ying is Asian and also implied to be queer, and Taina has a disease which requires her to use either a wheelchair or crutches. These are women from all walks of life and varying socioeconomic backgrounds, all united by their love of science. The comic as a whole tries to present a more realistic view of science, with some exceptions for Pym particles and sentient telepathic dinosaurs. Issues include “Nadia’s Neat Science Facts,” which explain topics from how joints work to radio transmissions to fun trivia about dinosaurs. Each issue ends with an interview with one or two women currently active in a STEM field. The fields include mechanical engineering, paleontology, and analytical chemistry among others. Notably, a few questions about comics are asked as well, as these are all women still holding onto their love of comics. These interviews are amazingly done and I can only hope that they show up in the trade. Importantly, The Unstoppable Wasp isn’t afraid to call out failings and complications of the STEM fields. We first meet Priya as she struggles with balancing her love of science with her desire for social acceptance. Near the end of the first issue, Bobbi Morse (Mockingbird) calls out an aspect of the pervasive sexism in STEM fields: men are more likely to lift up their male colleagues instead of seeking out new people from a more diverse landscape. One of the important themes of G.I.R.L. is that these young women help to bring each other to new heights and challenge each other in a way that they aren’t receiving in their home lives. In August 2017, Unstoppable Wasp ended at the eighth issue, approximately one month before the first trade came out. As was the case with guest star Mockingbird’s solo series and World of Wakanda, Marvel canceled a new reader-friendly, female-targeted comic book before much of the potential audience could even read it. Others have already covered the problems with Marvel canceling series before the first trade paperback release better than I have. Instead, I’m going to use the launch of the trade paperback to say one thing: get The Unstoppable Wasp for that young girl you know who is taking an interest in science. Though the series is technically rated T+, there are very few moments that aren’t appropriate for a preteen audience. Those moments, most notably Nadia’s conflicting views on violence in issue #4 and a talk about domestic abuse in issue #8, are handled with grace and in a mature manner. The Unstoppable Wasp never talks down to its audience either, and never gets bogged down in confusing technobabble; science is an important aspect of the book, but understanding science is just as important. If Marvel goes out of their way to promote it even the slightest bit, The Unstoppable Wasp is going to do amazing in trades. This is old news but I’m going to say it again: girls buy graphic novels. DC Superhero Girls: Finals Crisis, a graphic novel targeted to a young female audience, outsold many of its male-oriented counterparts. And outside of cape comics, middle-grade graphic novels by Raina Telgemeier such as Smile, Ghosts, and her adaptations of the Babysitters Club series, often hit the New York Times best-sellers list. 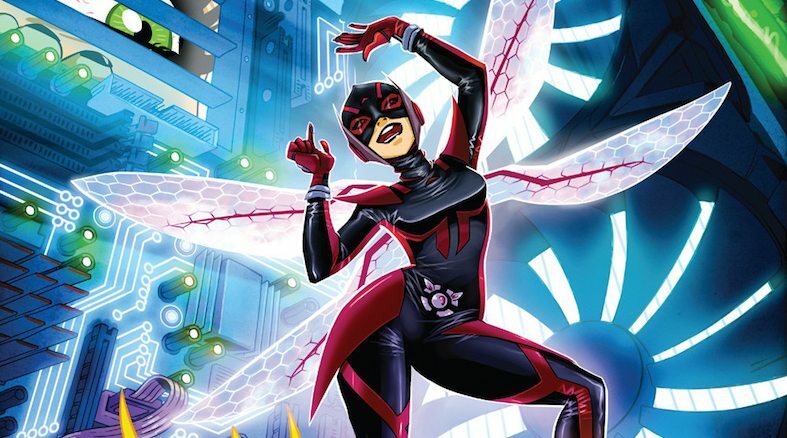 While The Unstoppable Wasp skews to an audience a little older, it still is a buying demographic that would respond amazingly well to a cute, fun, STEM-focused series. And really? It can’t be overstated how much a fun, bright series about a young female scientist is needed. There have been numerous studies about the lack of representation of women in STEM fields and how to change those numbers. One of those ways is simply knowing someone who works in a STEM field. A study by the Girl Scouts of America shows that two-thirds of preteen girls interested in a STEM field know someone in a STEM career and around half know a woman in a STEM career. Likewise, there are fewer media portrayals of women in a STEM field compared to men—which is a shame, considering that having a solid media portrayal of women in a STEM field helps dispel the stereotype that women aren’t good at the hard sciences and helps normalize the idea that women can be scientists for both men and women. 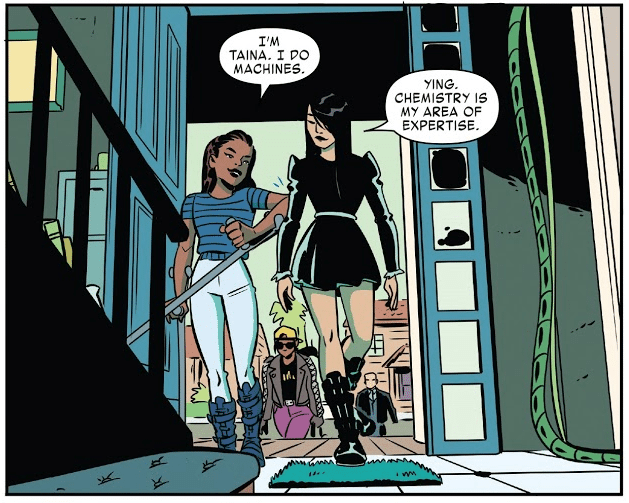 At the moment, Nadia is still showing up in the Marvel universe, though most of her recent appearances have been in Secret Empire, a slog of an event that’s on the opposite end of the tonal spectrum from The Unstoppable Wasp’s joy, brightness, and spark. Let’s hope that Nadia will see new life in another series with even a hint of the same fun, female-focused, STEM bent that The Unstoppable Wasp had.